Create and design your own Victorian interior for the Garfield doll house by Dorien Litjes-Donkers. : Pakjesavond. As promised. The gifts for our family by Sinterklaas. My daughter draw a lot with my name. Because I like to do projects 1:12 she gave me a lot of little wrapped in Sinterklaas paper presents. Wood and paper inside the paper. My sons girlfriend bought me a little birdhouse. She didn't know I had a birdhouse for my son also. I draw my son. They're looking for an apartment but that's hard to find in 's-Hertogenbosch. So my surprise was.....a birdhouse. It was to small for my self made items. I put them in the shoe box. A little kitchen with view. St. Jan's cathedral. I used a pushpin for the top of the coke bottle. Fimo clay for the coke and cap. I used the microwave for the Fimo. 1000 Watt for 2 seconds. You put your bottle in a microwave dish filled with water. Then you put it in the microwave. Bottle is not perfect but for this project good enough. For the jar I normally use spar. But this was from a broken pencil. That was made of cork. As cover a thumbtack. Just paint and you're ready. Her video explanation tells exactly what to do. The sink is a painted cap. The tap is painted plastic wire with little pearls on both side. Counter is also Fimo clay. So far Sinterklaasavond and the self made presents. Wat heerlijk om te lezen dat jullie een gezellige Sinterklaasavond hebben gehad. Je bent fijn verwend met mini kadootjes, Dorien én je hebt zelf ook niet stil gezeten, zie ik. Leuk dat je allerlei tips op je blog met ons deelt. Het voedsel ziet er in ieder geval goed uit net als je Cola fles. Thanks for your sweet words Ilona!! I'm really spoiled. Maybe people get tired of me sharing my tips. But maybe someone can use them. Looks like you had a fruitful Christmas. 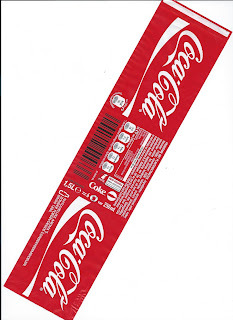 It is amazing how simple things can be used to create the illusion of something quite different, for example your coke bottle. Your first try at mini food is very good I must check out the link. Thank you for visiting my blog and Happy New Year! Thank you Margaret. I think the link for the coke bottle you can find in elder post. Using the Micro wave gives the Fimo another color !! Happy New Year for you also.